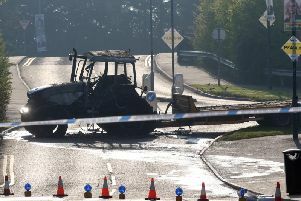 Police are investigating a suspected arson attack at a disused property in Lisburn at the weekend. Fire crews from Lisburn and Belfast were called to a blaze at Derryvolgie House, Belfast Road, near Hilden on Saturday evening, April 22. Emergency services personnel were alerted to the fire after local residents spotted smoke billowing from the vacant building, which was previously owned by NI Water, at around 6pm. A Northern Ireland Fire and Rescue Service spokesperson said two fire crews and a Command Support Unit from Lisburn, two crews from Cadogan and one from Springfield Fire Station were tasked to the incident. “Firefighters dealt with a fire in an unoccupied building. The incident was dealt with at 9.56pm and the cause has been determined as deliberate ignition,” the spokesperson said. A PSNI spokesperson confirmed that police officers were called to the scene at around 6.20pm. “At this stage it is believed that the fire was deliberately ignited, however enquiries into this incident are currently ongoing,” she said.